Geneva, Switzerland – April 2, 2015 – IBJ Singapore is pleased to announce the ASEAN Youth JusticeMakers 2015 Competition. The Competition will award US$5,000 in project funding to young lawyers, aged 20 to 35, from ASEAN countries (Brunei, Cambodia, Indonesia, Laos, Malaysia, Myanmar, the Philippines, Singapore, Thailand, Viet Nam, and also including East Timor) who have the most innovative, efficient, and sustainable criminal justice implementation project ideas that aim to eradicate torture as an investigative tool and increase awareness and enforcement of due process rights in their communities. JusticeMakers is the world’s first global, online, innovative platform in the area of criminal defense. As of 2014, IBJ has built a global community of 55 JusticeMakers Fellows from 37 countries throughout the world. One of its main components is the online competition, which identifies, trains and funds hidden heroes of justice worldwide who are committed to advocating for positive reform within their respective countries. The JusticeMakers Competition requires individuals to submit proposals detailing an innovative strategy for promoting criminal justice implementation at grassroots level. The individual applicants are selected from a vast pool, allotted a US$5,000 stipend to fund their projects and are required to undergo an online training conducted by IBJ Singapore, which are geared toward assisting them in the effective implementation of their projects. 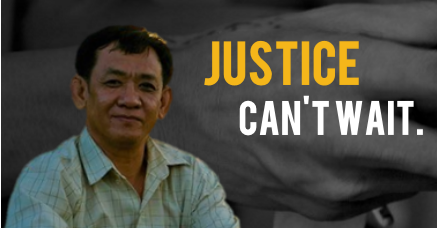 IBJ initiated the JusticeMakers Program in 2008 in an effort to connect defenders in their quest to curb torture and legal rights abuses in their respective communities. The JusticeMakers Program fuels the international movement towards ensuring that every man, woman and child has the right to competent legal representation, a fair trial and protection from torture as well as cruel, inhumane and degrading treatment. As the result of collaborative efforts and through the use of web technologies, an online community platform was launched, which serves the purpose of building a unified network of defenders, facilitating discussions and hosting competitions which fund projects to curb the abuse of legal rights within participants’ respective communities. The Competition winners and previous JusticeMakers Fellows form lasting relationships with hundreds of partner organizations across the globe, including but not limited to; governmental and civil society organizations, universities, and national bar associations. All of these partnership efforts are aimed toward the creation of a criminal defender community which will raise the profile of criminal defense practices and continually strive for justice reform. In this way, the JusticeMakers Program creates an internationally-linked network of national criminal defense communities committed to the prevention of torture and cruel and unusual punishments. Sensitizing the community to the prevalence of such issues, coupled with gaining the support of local organizations has created a platform by which major reforms have taken place. For more information about the JusticeMakers Community and to apply for an ASEAN Youth JusticeMakers Fellowship 2015 visit http://www.justicemakers.ibj.org. For specific questions please send an email to justicemakers@ibj.org. 2015 ASEAN Youth JusticeMakers Competition is sponsored by the National Youth Council of Singapore and apVentures. In recognition of the fundamental principles of the Universal Declaration of Human Rights, International Bridges to Justice (IBJ) is dedicated to protecting the basic legal rights of ordinary citizens in developing countries. Specifically, IBJ works to guarantee all citizens the right to competent legal representation, the right to be protected from cruel and unusual punishment, and the right to a fair trial. IBJ currently has programs and projects in over 40 countries in the world, including Burundi, Cambodia, China, India, Rwanda and Zimbabwe.